In the spring of 1893, Grand Duke Ernst Ludwig of Hesse and by Rhine and his youngest sister, Princess Alix, traveled to Italy for three and half weeks to +sightsee. The siblings spent their time in Florence and Venice, visiting churches, museums, and other sites, along with spending time with family members including Princess Marie of Battenberg (the wife of the Count of Erbach-Schonburg) and the Hereditary Princess Charlotte of Saxe-Meiningen (nee Prussia). After returning to Darmstadt, Alix wrote to her friend Toni Becker about her trip. "Our stay in Florence was idyllic and the weather so favourable all the time --we have seen a lot, but one is never finished. There are almost too many beautiful things here." There is no doubt that the trip proved successful for the siblings. Ernie, for one, was able to indulge in his love for art. It was also a time for Ernie and Alix to spend time with family, including their grandmother, Queen Victoria, who was also on holiday in Italy. No doubt, the Queen was considering marital partners for the siblings. She certainly had a wife in mind for the artistic Ernie: his first cousin, Princess Victoria Melita of Edinburgh. They got engaged in January 1894 and were married three months later. It was at Ernie's wedding that Alix finally accepted Nicholas' proposal. By the end of 1894, Alix had converted to Orthodoxy, married Nicholas (who had succeeded his father only weeks earlier) and had become the Empress (consort) of all the Russias. Kleinpenning has made the most of her sources. She offers readers a bit of insight into Ernie and Alix's final year of singlehood, traveling together as tourists, sharing confidences and enjoying each other's company. One can imagine their conversations as they observed great art. This book may be slim, but it offers insight and retrospect. Ernie had succeeded his father in 1892 and was finding his way as the Grand Duke. His three older sisters were married with families of their own, leaving Alix as the only sister at home. During his lifetime, Ernie visited Italy several more times. Although Alix desired to see Italy again, she never again visited the country. 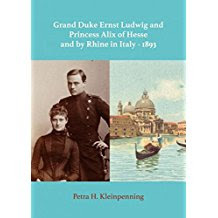 Grand Duke Ernst Ludwig and Princess Alix of Hesse and By Rhine - 1893 is available from Amazon.co.uk, but not Amazon.com. It is a print on demand book. The book's publisher, Brave New Books, is located in the Netherlands. Going to say it right now ... The Wandering Princess by Edward Hanson is the best royal book of the year. This is the first biography of Princess Helene of France, Duchess of Aosta (1871-1950) ... and it was worth waiting for. Helene, the third of eight children of Prince Philippe, Count of Paris, and Infanta Marie Isabelle, daughter of the Duke of Montpensier and Infanta Luisa Fernanda of Spain. She was born in Twickenham, England, as her family was in exile. The young Helene grew up in a social setting that brought her into contact with members of the British royal family. She was a favorite of the Princess of Wales and a friend of Alexandra's three daughters. Helene also caught the eye of Prince Albert Victor, Duke of Clarence and Avondale, the eldest son of the Prince and Princess of Wales and second line to the British throne. Helene was certainly suited to marry the second in line to the throne with one huge caveat. Helene was Roman Catholic and Eddy, as the Duke of Clarence, was called by his family, would lose his right to the throne if he married a Roman Catholic. Her father, a devout Roman Catholic, put the kibosh on Helene's desire to join the Anglican church. The Duke of Aosta was heir presumptive to the Italian throne until 1904, when Queen Elena gave birth to a son, Umberto. The marriage between the Duke of Aosta and Helene was not a success. By 1900, following the birth of two sons, the couple lived largely separate lives. Helene could not accept her husband's philandering behavior and she was ill-suited to life at the Italian court. Although she supported numerous charitable organizations, including the Italian Red Cross, Helene spent most of her time away from the court, away from Italy, traveling with friends to the Middle East and Africa. These travels were documented by Helene's camera and her travel diaries. 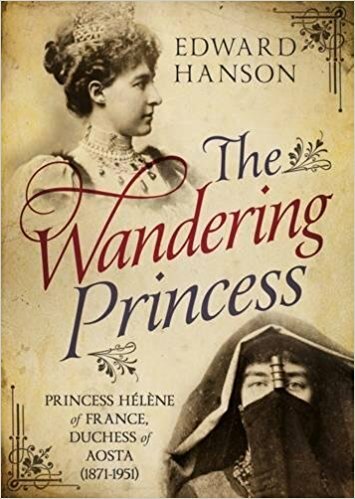 There is such detail in this book -- as Hanson brings Helene alive through her own words. The discourse in her marriage -- and her spirit of adventure -- offered Helene the opportunity to carve out a more independent life in the early part of the 20th century. In later years, Helene considered Emanuele Filiberto to be her best friend, but she acknowledged that there was no love for him. The first betrayal of his marital vows occurred not long after their marriage. Helene was very much a wandering princess. She put her own needs before her family's, including her two young sons, as it was unusual for a woman of her stature to be so very independent minded. The wandering was put on hiatus during the first world war as she remained largely in Italy to support her husband's family. But once the armistice was signed, she was already planning her next trip. She also had her own lover, Otto Campini, whom she married in 1936, five years after the death of the Duke of Aosta. The major blot of Helene's life was her open and enthusiastic support for Mussolini and fascism. This support made it difficult for Helene to communicate with her elder son, Amedeo, the 3rd Duke of Aosta, who was being held by the British in a prisoner-of-war camp in Kenya. He died in the camp. His younger brother, Prince Aimone, the 4th Duke of Aosta, was named as King of Croatia, although he never reigned in the country. The Italian monarchy came to an end in May 1946, when a referendum led to the establishment of the Italian republic. Although King Umberto begged Helene to join the family in exile, she sought the comfort of her home at Capodimonte, which had been her residence since 1905. Although the new Italian government allowed Helene to remain in Italy (the law of exile applied to the male descendants of all the Italian kings and their male descendants), she had to leave Capodimonte and move into a new home. In January 1948, Helene's younger son, Aimone, who was married to Princess Irene of Greece, died in Argentina, leaving his young son, Amedeo, as the 5th Duke of Aosta. Helene was 79 years old when she died on January 21,1951. She died in Italy, which had become her home in 1895. She understood exile, as she had been born in England, not France, as her family had been in exile since King Louis Philippe lost his throne in 1848. Unwilling to accept the traditional (and dutiful) role of the wife of an Italian royal, Helene chose her own path. She preferred to live her life largely on her own terms. The Wandering Princess is a brilliant book that has all the qualities of what a good royal biography should be. For starters, Hanson has well-researched his subject (take a look at the comprehensive bibliography) and the writing is neither stilted nor stuffy. Hanson has a comfortable scholarly style. This means the book is readable for historians and the general public. This should not come as a surprise. An American by birth, Edward Hanson studied history before he moved to England where he was ordained as a priest in the Church of England. 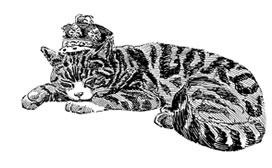 I wait for news of what Edward Hanson's next royal subject will be. But for now, please feast on The Wandering Princess, a most wonderful book. There is no doubt in my mind that The Wandering Princess will become a classic biography that will be wanted by royal readers for years to come. You will not regret reading this book. Treasure it. Royal biographies like this do not come along very often. Here is a selection of books available in English on King Michael. The Romanian publishing Curtea Veche has published excellent books on the Romanian royal family. The search term is regele Mihai. Several books have a good selection of photos. I have ordered from this firm several times. Very easy even with the Romanian language. Hit the translate button. The books are largely inexpensive and the postage costs are not prohibitive, even if sending to the USA.